A calendar from 1798 including a view of Merton College in Oxford. The Oxford Almanack For the Year of our Lord God MDCCXCVIII. 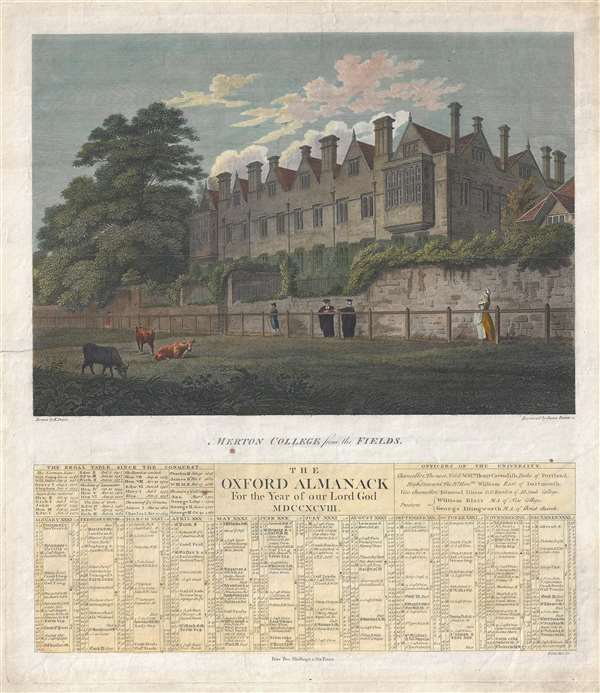 This is a 1798 Oxford Almanack calendar engraved by James Cole II with a view of Merton College in Oxford, England drawn by Edward Dayes and engraved by James Basire II. Seen from Merton Field, situated north of Merton College, the view depicts St. Alban Hall, which was an independent academic hall owned by the convent of Littlemore until it was purchased by Merton College in 1548 following the dissolution of the convent. It continued as a separate institution until it was annexed by the college in 1881. Cattle are illustrated in the foreground, with students and faculty members shown on a walk next to the wall separating St. Alban Hall from the field. Below the view is a calendar for 1798 that notes holidays and other important dates, including when Oxford and Cambridge terms begin. Above the 1798 calendar, a table of British kings and queens from the Norman conquest by William the Conqueror to George III. The officers of the university, including the chancellor, the vice chancellor, and the proctors. Merton College (The House or College of Scholars of Merton in the University of Oxford), one of the constituent colleges of the University of Oxford, was founded in 1264. Mob Quad, one of Merton's quadrangles, which was constructed between 1288 and 1378, is claimed to be the oldest quadrangle in Oxford. Merton College Library, which dates from 1373, is the oldest continuously functioning library for university academics and students in the world. J.R.R. Tolkien, the author of The Hobbit and The Lord of the Rings trilogy, held the post of Merton Professor of English Language and Literature from 1945 to 1959. This Oxford Almanack broadside was created by Edward Dayes, James Basire II, and James Cole II and published in 1798. Edward Dayes (1763 - 1804) was an English engraver and watercolor painter who worked in mezzotint. He studied under William Pether and first exhibited his work at the Royal Academy in 1786. He exhibited at the Academy throughout his life, in total contributing sixty-four works during his lifetime. The art historian Graham Reynolds sees Dayes' work as 'marking the transition from the eighteenth to the nineteenth century'. He committed suicide at the end of May 1804. James Basire II (1730 - September 6, 1802), also known as James Basire Sr., was an English engraver and copperplate printer. From a family of engravers, Basire's father, Isaac Basire (1704 - 1768) was a cartographer, and his son (1769 - 1822) and grandson (1796 - 1869)(who were also named James) were all engravers. He served as an apprentice to Richard William Seale beginning in 1745 and the artist and antiquary Richard Dalton in 1748. Basire was appointed the engraver to the Society of Antiquaries on March 8, 1759 and to the Royal Society in 1770. He married Anne Beaupuy on May 11, 1760 and later Isabella Turner. It is unclear how his marriage to Anne Beaupuy ended. James Cole II (fl. 1754 - 1800) was an British engraver and writing engraver. Cole engraved A plan of the intended navigable canal from the Coventry Canal near Coventry to Oxford by James Brindley and Robert Whitworth in 1769. He also worked on the calendars for the Oxford Almanack. Very good. Repaired tear, from left side center, extending about 2 inches into the paper. Else clean. British Museum Number 1866,1114.273. OCLC 497525556.